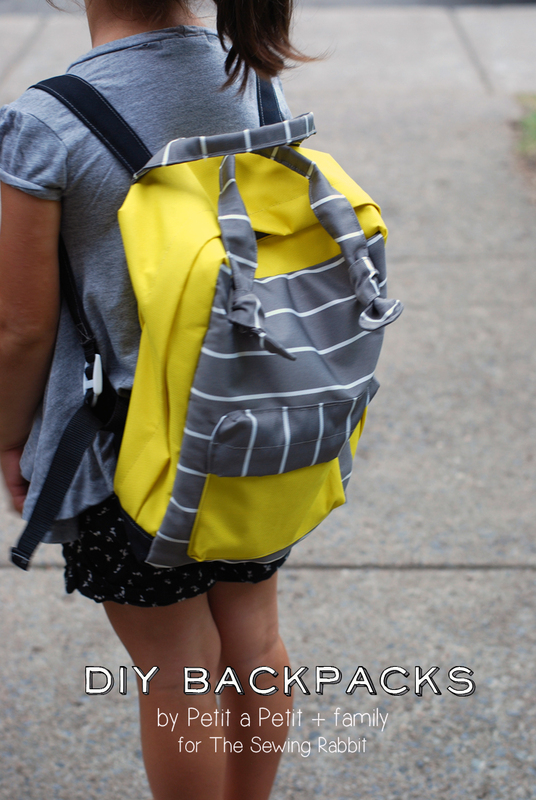 Looking for a great back to school backpack for your little one? Well, buckle your seat belts my friends because Celina of the Sewing Rabbit Team has an amazing treat for us today! 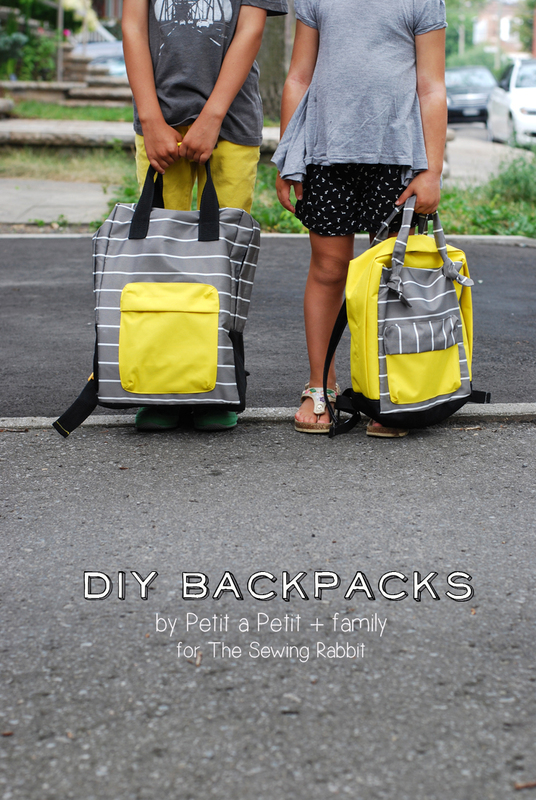 She is sharing a mind-blowing graphic video teaching you how to make your own Mini-Backpacks! Perfect for the little ones on the go. 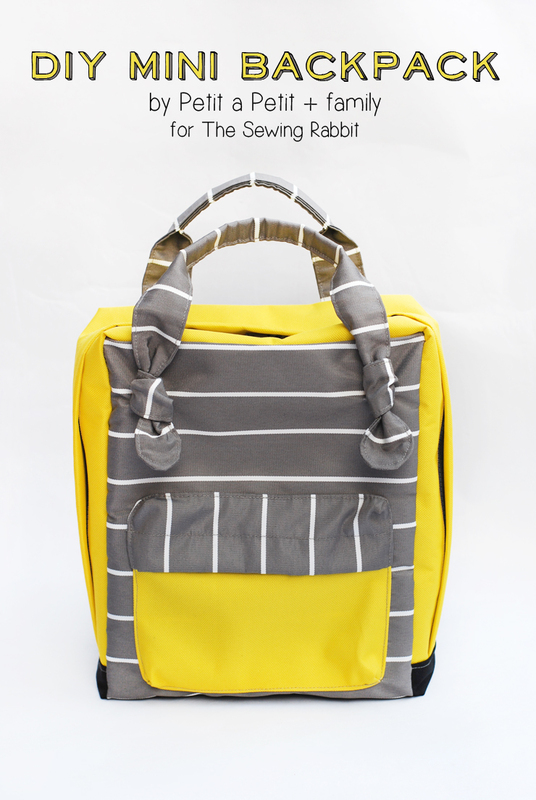 Since it is back to school for so many of us I thought it would be nice to do a sewing tutorial for a backpack. I’ve been spotting lots of square shaped backpacks these days, as well as lots of different ways of colour blocking- I thought I would combine the two to give you one cute little bag. I also prepared a little video for my tutorial which I hope you will enjoy. You can simply follow along and pause when you need to! Save it to your favourites and watch it over and over! Careful, the song is really catchy! In case you are wondering, the fabric I used was what they call at my local fabric shop “outdoors fabric”. 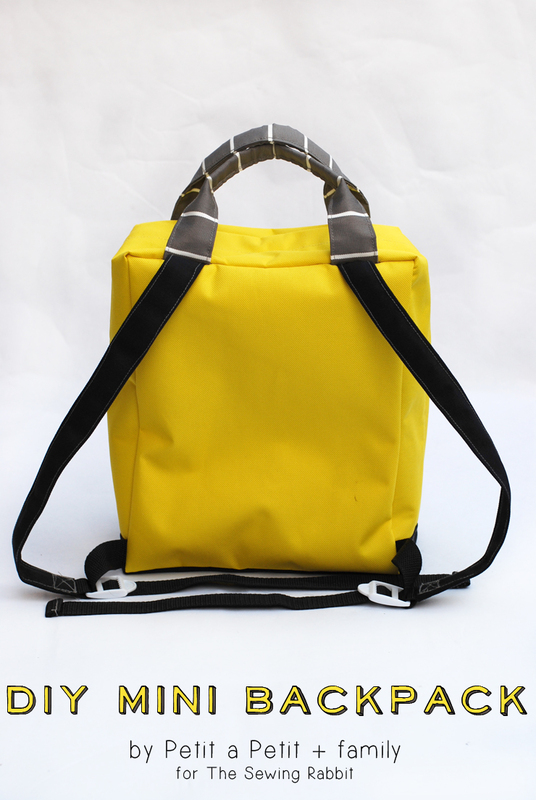 It’s mainly a Nylon type of fabric with a coating which makes it a little more durable as well as water resistant. I also used some Cordura Nylon (black) which has a very sticky and plasticky backing and makes it really hard to sew with. 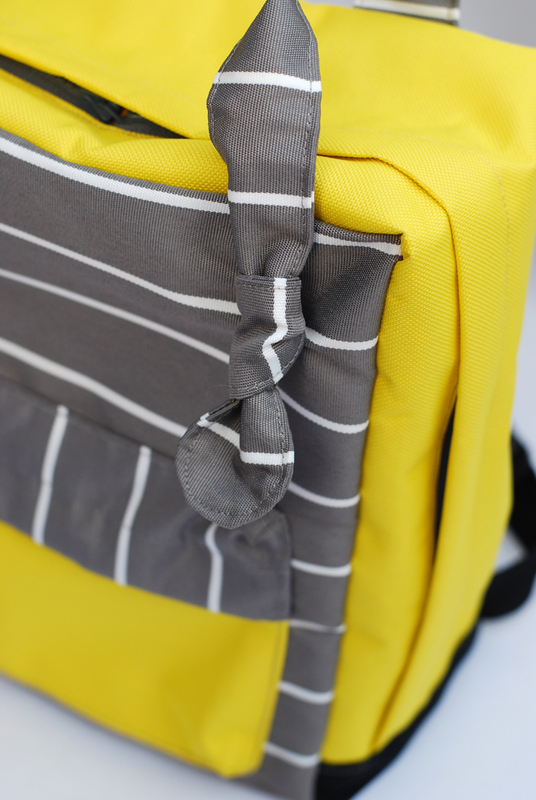 I think I would have liked my fabric to be a little more sturdy, but what I love about the backpack is how light it is. You could use some denim or canvas if you like, you could also interface it. With all the different pattern pieces you can make this little backpack as wild as you want or keep really simple. I had a little fun! I made the bottom black, as that is the part that gets the most dirty. I used some thick plastic zippers, however metallic ones are fine too. You could substitute the Nylon Webbing for some fabric or Gros Grain ribbon. Lastly, I used some plastic adjusters for my straps, those could have been a pair of D-rings as well. 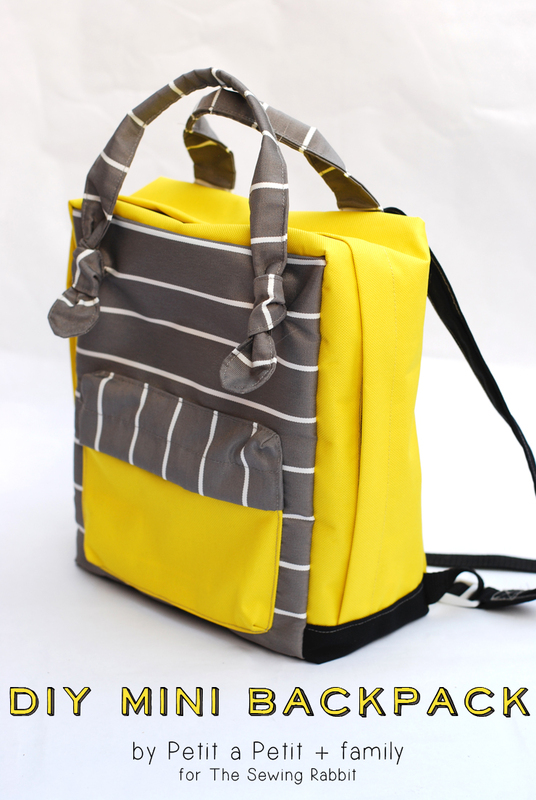 This mini backpack offers lots of possibilities and it is really quite simple to sew. The hardest part was sewing on the front pocket. And if you notch all your pieces as indicated, as well as pin things to keep them in place, you will be fine. Well I couldn’t just make one backpack with 2 kids in the house. Today is my son first day at kindergarten, so he got a slightly bigger backpack with a few differences here and there. The tutorial is on my blog Petit a Petit and Family, if you’d like to check it out. My daughter was a little upset that hers wasn’t as big as her brothers, she soon realized this was the perfect size for all her little goodies and specially her small back. I’m thinking I could use one of each for myself as well, maybe in some nice Liberty of London print or I could up cycled pair of pants I have. What would yours look like? Holy wow! totally awesome…I love the colors. Great job Celina and the video is fantastic! Thanks Jane! Yay, so happy you like it! I had so much fun making the backpack and the video! Celina, these are incredible!! LOVE them! The handles are a great idea! Thanks! They are super practical and the kids love them too. You can’t watch the video above? Try refreshing your page! Hoping the above comment isn’t meant in the way it reads. I can’t watch vids on this pc and was hoping the above mentioned Tutorial ‘The tutorial is on my blog Petit a Petit and Family, if you’d like to check it out.’ would possibly have pics I could follow, but it’s all good and I will have to wait until I am able to get in front of another PC. Oh Suzie, I hope you can watch later 🙂 I would be happy to add a pdf version! Just give me a couple of days to get it done. So happy you like it! This is GREAT! Is there non video instructions somewhere? Hello Nicole, happy you like the backpacks! I will work on a PDF version over the weekend and link it up here for a non video version. I hope this helps! That would have been nice. I like the pattern but pausing the video at each still so I could do an image snip then using combine in acrobat on them was slow. Ooooooh! So COOL! Great tutorial! You are amazing Celina! Absolutely fabulous! Thank you sooo much Shannon! Thank you. Those backpacks are soooo cool Celina!! Those photos of your kids together – LOVE IT! Thanks Mie! Those kids are pretty cool 😉 and I love that they get along so well! I am lucky mom. This is so cool! I love how both backpacks are similar but have their own details. The videos are incredible and I don’t know about the kids but I want one of those backpacks for me. You are amazing Celina. Oh my goodness girl, you are a wizard with fabric 🙂 So adorable. 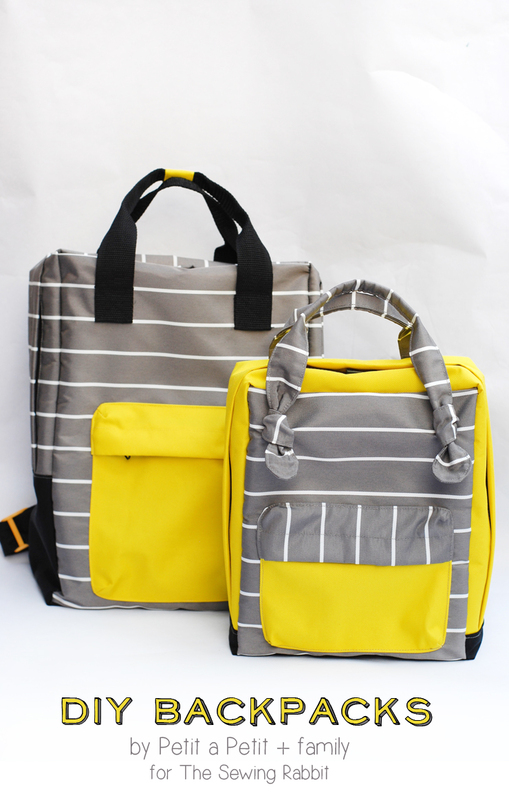 I’m sure your kids will have the most stylish backpacks in their schools! Best tutorial EVER!!!! So cool! I have NO idea how to put together a blog post this awesome, but I’m glad you do! haha! Haha! you crack me up Vanessa! So happy you enjoyed it. 🙂 thanks so much! I am finally putting everything I learnt in school to good use! Hi there do you happen to have paper instructions I can print out? Plese tell me where I can buy this backpack? I really want to make these for my girls, but some of the steps are confusing on the video. Do you have a PDF version somewhere? If you do, maybe you could send me a link? Starkat21 [at] gmail [dot] com. Thanks so much! I love these backpacks! Oh, I love this backpack very much!! Don’t mind the mini, I want this for myself! I know this post is quite old, but I was just searching for a backpack I can make for my niece which will be starting daycare soon and found this wonderful project. Unfortunately I can t find the tutorial or the pattern for it anywhere. Does anyone know where I could find it? I find this video goes too fast so it makes it very confusing to try and make this back pack. Is there a PDFs of this pattern?